A Vitamin K enriched eye cream by Belli Beauty that revives and illuminates tired eyes, and minimizes the appearance of fine lines. Features Vitamin K to help reduce the appearance of dark circles. Vitamin B3 also helps the area around the eye look restored. 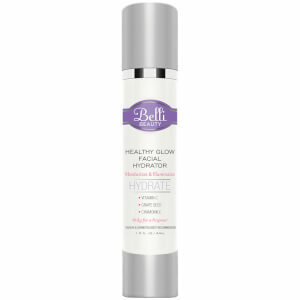 Hydrates delicate skin around the eyes to reduce the appearance of puffiness. Cools and comforts on contact. Gently pat underneath eye area as needed to keep eyes looking refreshed and well rested. Started to use this right after I gave birth to my son. With all the new baby craziness and lack of sleep, my dark circles didn't get worse. But it didn't help with the dark circles that were already there before I gave birth. So I suppose it is a good product to "maintain" the situation rather than "improve". Also, if you live in a super dry area like we did, you probably need another coat of some other eye cream to hydrate even more. Bottom lineL it's nice to know it's safe for the baby while breastfeeding. This did nothing for me, but I live in the desert & it's hard to find an eye cream that can moisturize this dry skin. Sent it back.